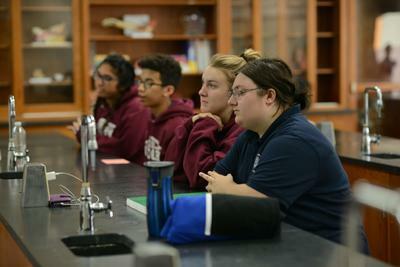 Shenandoah Valley Academy aims to provide an academic experience that teaches our students to become motivated students and independent thinkers – not just mere reflectors of other person’s thoughts. The curriculum is designed to provide students with a foundation of knowledge for college, critical and analytical skills, and academic challenges to enhance intellectual self-confidence. The academic program at Shenandoah Valley Academy is designed to provide students with a foundation of knowledge and study skills. SVA offers a college preparatory curriculum with broad and diverse course selections. Small class sizes help teachers engage every student. Ninety percent of our teachers have a masters’ degree. Our academics operate at high standards and students are pushed into critical analysis and thinking with the goal of enhancing intellectual self-confidence. We offer 29 semester hours of college credit through our Dual Credit program with Washington Adventist University and an additional two (2) Advanced Placement (AP) courses. We recognize that not all students have the academic background to pursue an advanced diploma, including Dual Credits, and/or AP Exams. For these students we offer a college preparatory course of studies that will meet minimum course requirements required for admission to most colleges and universities. A standard diploma is also offered for those students who do not wish to attend a four-year college after graduation. *Cumulative GPA is based on an unweighted 4-point rating system. Class Rank is based on a weighted system with all AP, dual credit and advanced courses earning a 5-point rating. In addition to the career and college selection materials located in the library, the Career and College Counselor is available throughout the school day. Seniors meet individually with a professional career counselor and take the Strong Interest Inventory. Juniors take the Meyers-Briggs Aptitude Test and have the opportunity to meet with a counselor individually.